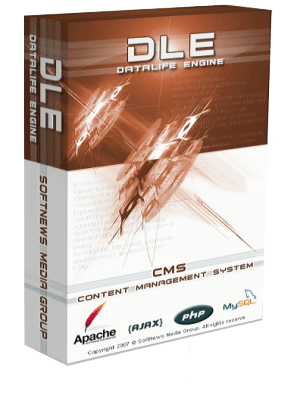 DataLife Engine is a multifunctional Content Management System. Thanks to a very powerful news, articles, and users management system, DataLife Engine is designed primarily for the own mass media websites and blogs creation on the Internet. A wide variety of basic features of the engine, which are initially integrated into it, allows DataLife Engine to step further ahead of its nearest competitors in terms of the website creation. And thanks to the precise and sophisticated core structure that minimizes the load on server resources DataLife Engine is able to easily work with projects with a large attendance keeping the server load on a minimum level. The flexibility and ease of customization and integration of custom design allows you to study and understand the structure of templates and deploy your own websites as soon as possible, without any additional material costs. Advanced AJAX technology allows to reduce both traffic and resources on your server and your visitors’ traffic, not to mention the ease of use of this technology on the website for your visitors. Due to increased attention to the security of the engine, to its convenience, and to its dynamic development, more than 90 000 portals around the world, that are successfully use it in work, have already spoken out in favor of DataLife Engine. Much attention is paid to the search engine optimization, which allows to lead more visitors to your website. DLE - is a highly professional CMS. Easily customized for your needs. Optimized work with server allows efficient use of its resources. Excellent value for money. Responsive technical support. We wish developers continued growth and prosperity. You get a ready modern website out of the box, which contains all the necessary functions and stuff. All the new technologies that appear on the Internet are shortly appear in new versions of DLE. Thus, your will always have a modern and high-tech website. You just need to add your specific functions and your successful project is ready. I think DLE is the best CMS in functionality, performance and architecture. Highly recommended! I use DLE since ver.6.2. It's since 2007! And now ver.10.4 is available and we are in 2015 - it's 8 years. Dear collegues, it's up to you to decide whether to use this CMS in your projects or not. I use this CMS for 7 years. I have tried a lot of engines, but DLE remains the most loved and used. The engine is convenient because it allows you to create a site of absolutely any subject. It perfectly supports projects with the attendance of over 100k a day, without excessive load on the server. As for me, the template engine of DLE is the best among all the modern CMSs. There is a lot of cool developers and designers of plug-ins for DLE. You can without a doubt take the DLE and supplement it with everything you want when building a website - it has fantastic flexibility. If I need to create news or informational resource, I don't even think about using any other engine - DLE is an unmatched solution for this purpose. CMS Data-Life Engine is one of the best CMS for the website creation. This CMS allows you to create your own Internet shop or catalogue of your products. Due to the simplicity of the code, you can always make your changes, and create additional functions. Our resource is conceived as a multi-user blogging portal and DLE was chosen because of the opportunities for the separation of rights of the registered users it has. It should be noted that the engine copes with its tasks perfectly: fast work under a high load, low requirements on server resources, just a plenty of all kinds of settings. Excellent opportunities for SEO optimization content display. The most professional CMS - you can impose any design, build anything you want into it, there is no limits ... Convenient and easy to use, relevant and modern code, updating and support of actual libraries. I work only with this CMS. I have absolutely no desire to switch to the other ones. I'm a fan of DLE! This engine is great!